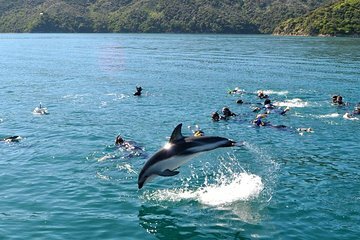 Slip into Marlborough Sounds for a swim alongside pods of wild dolphins, with certified guides to help find the dolphins and ensure the tour is dolphin-friendly. Watch for dusky, bottlenose, common, orca, and Hector’s dolphins, and if conditions allow, you’ll have the chance to view the dolphins from inside the water. This dolphin tour includes wetsuits with hoods and booties, as well as hot drinks on board the boat, and round-trip transport from the Picton waterfront.